I know, much catching up to do. It shall have to wait – lots of busy going on, much stress.Â Just stopping by to make a note on current frustration levels. 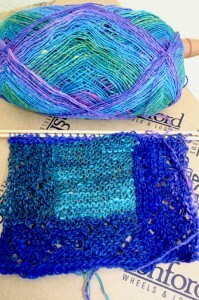 Well, today I recommended the knit to somebody in a Ravelry forum. It occurred to me that recommending an untested pattern is a wee bit silly. So, of course, I cast on. I was having fun. Truly, I was. Knitting squares is a new activity for me. But that is not the root of the frustration. My first square is nearing completion, having gone quickly and well though the first four sections (it is basically log cabin, with lace).Â I came to section five. I picked up stitches as directed -Â 32+1=33. 4, 15 sts out of the bo row of section 1 and 9 sts out of the edge of section 2 â€“ 33sts. I knitted the first 2 rows as directed -Â slip 1, knit 32 = 33 stitches. I make that 36 stitches, don’t you? Have emailed for assistance but (a) I hate being stuck when I was on a roll and (b) am greatly frustrated because I wanted to knock this off and report back on how easy it was, plus (c) I’ve obviously recommended a dud! There won’t be much progress on this in the short term, even if I get my query resolved. I don’t seem to have the right size of circular needle to border the squares. EDIT: The designer replied very quickly to say the written instructions are wrong, though the charts are correct (never thought to check!) Correct instructions have been supplied.